All buildings of the country-house complex are made of pinewood. 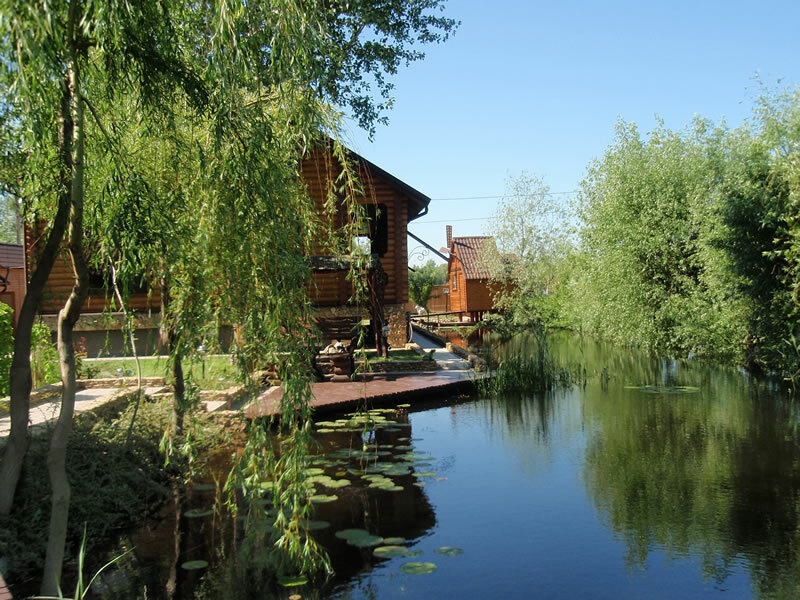 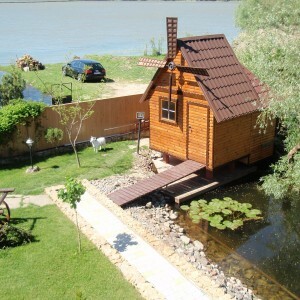 A two-storeyed log cabin of the guest house is rising above the river with original, upward, wooden structure resembling a fairytale tower. 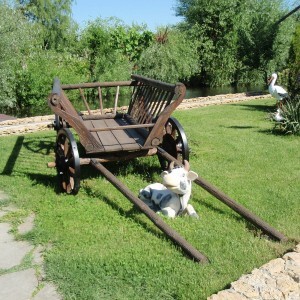 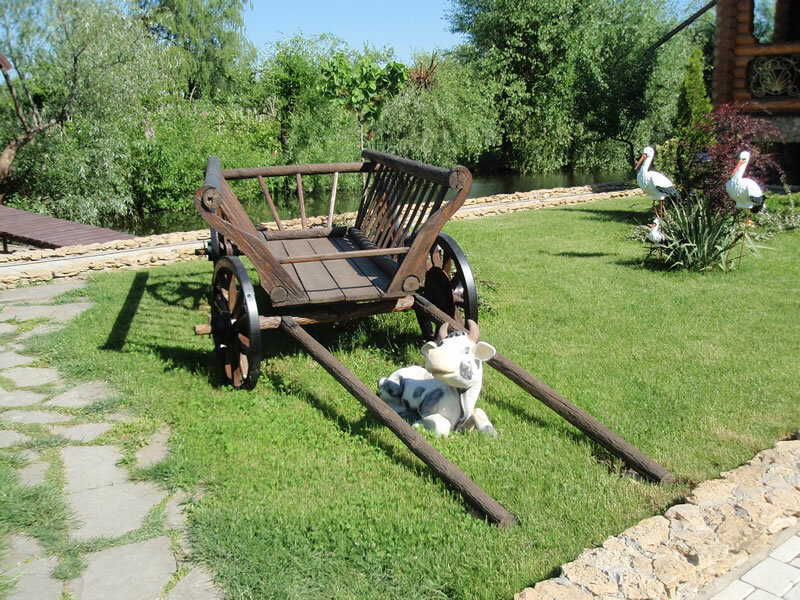 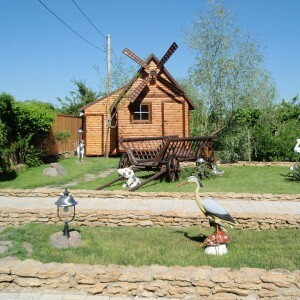 And the whole territory is glade-shaped: a small wooden mill, kindly waving its wings, as if talking to people; decorative storks and wild boar live peacefully on the green lawn; the old cart dropped its shafts waiting for trip. 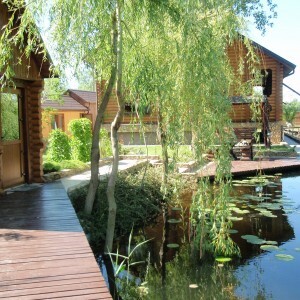 The country-house on both sides is surrounded by the channel, stretching beyond the territory of a “Villa”. 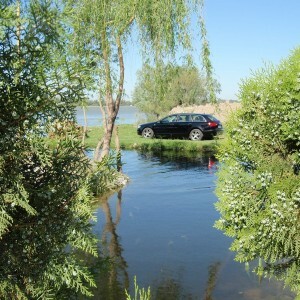 Green willows, apple orchard and vine enveloped the channel. 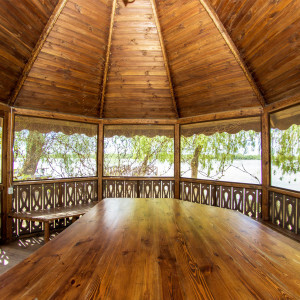 There is a dining room on the channel. 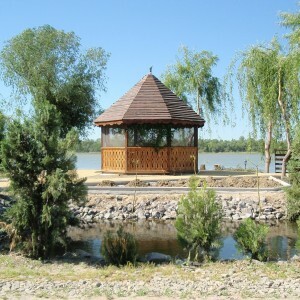 Everything necessary is provided for tranquillizing body and mind. 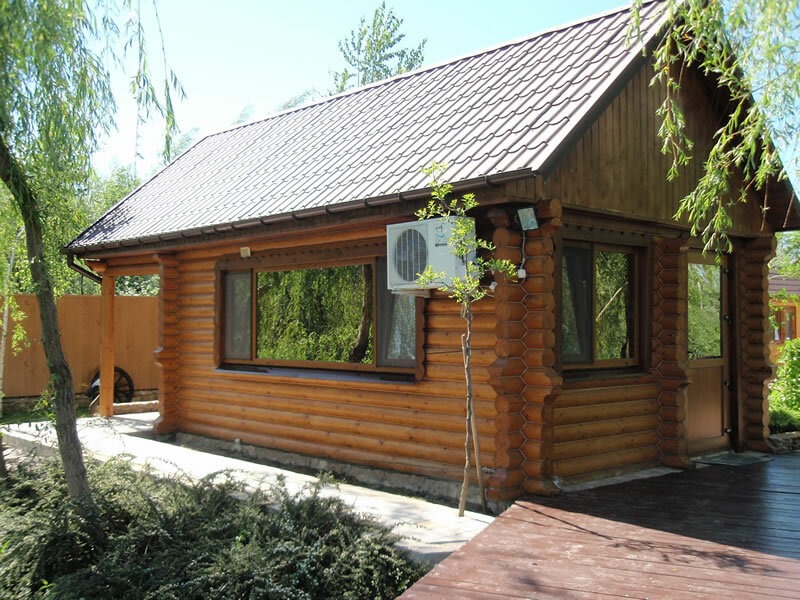 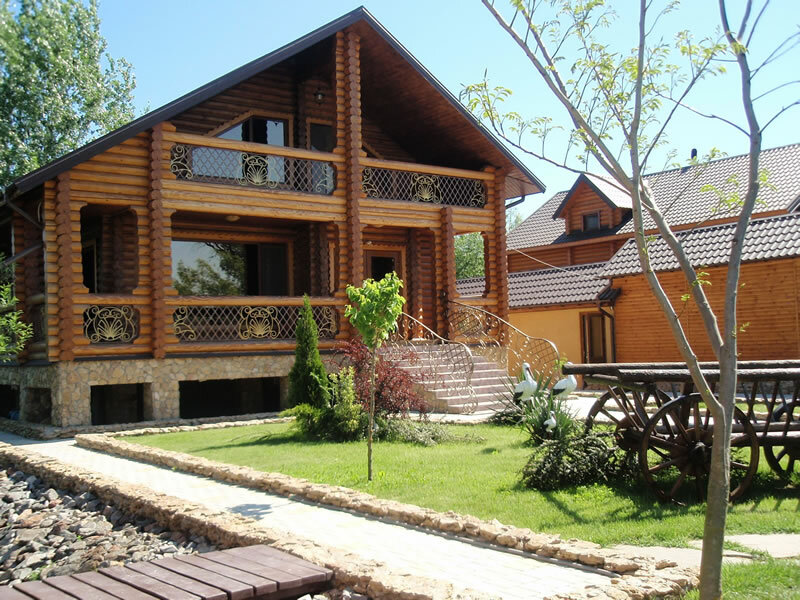 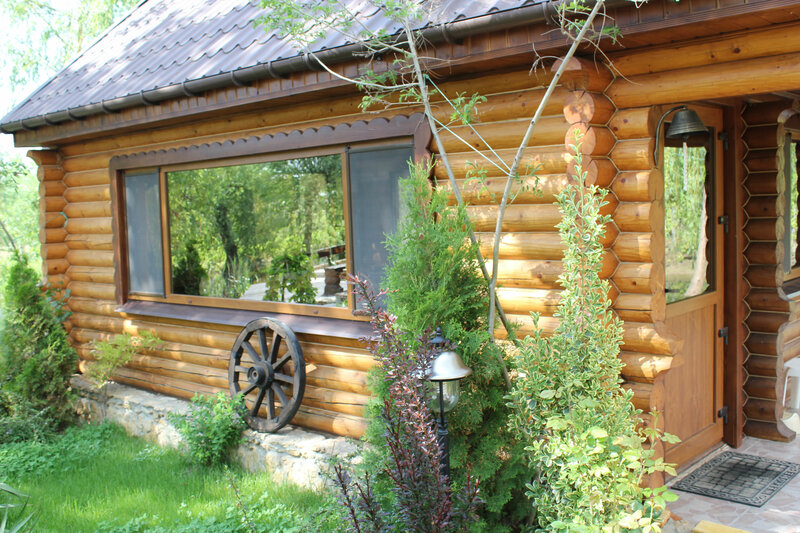 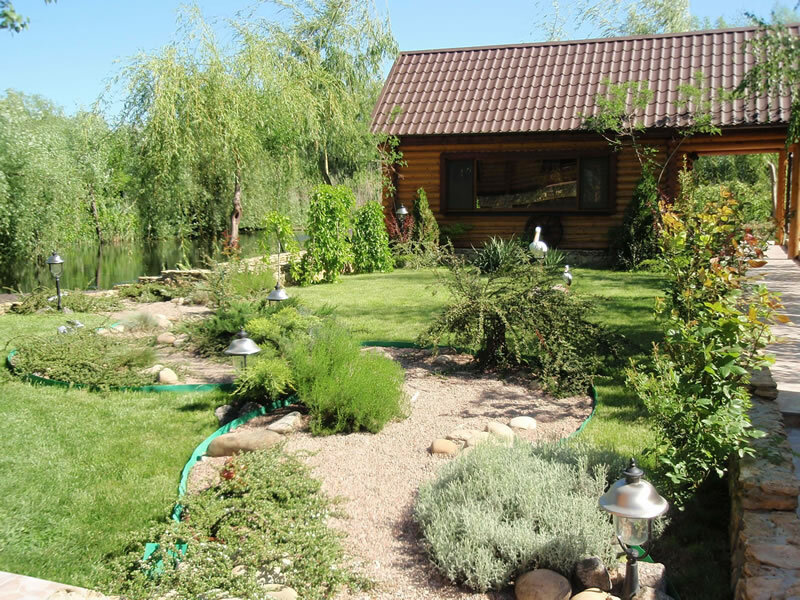 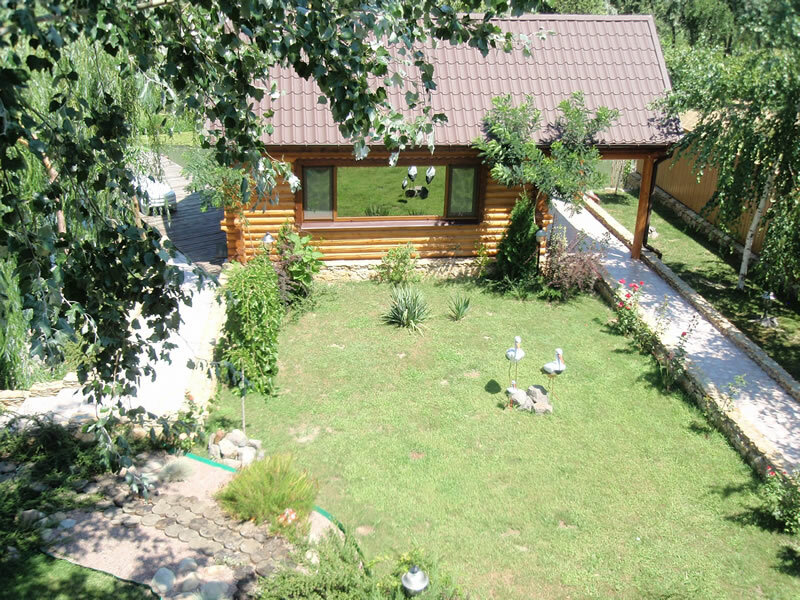 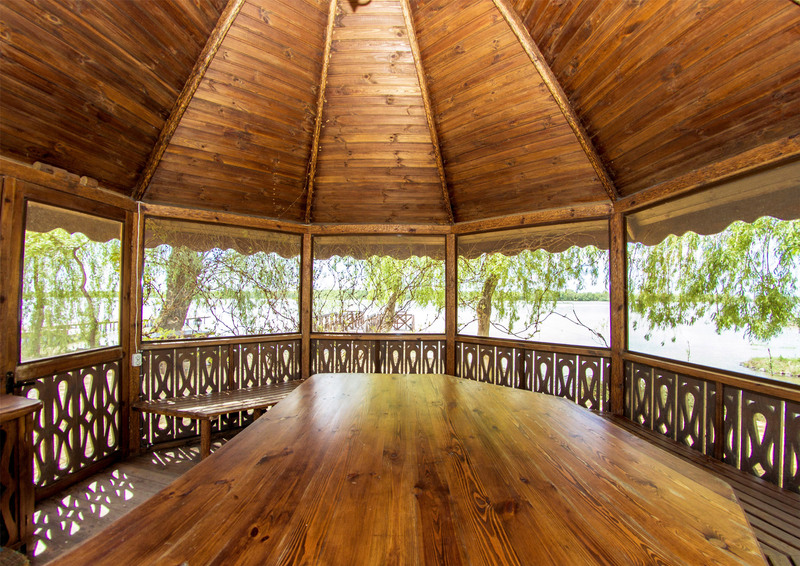 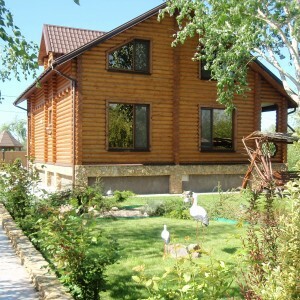 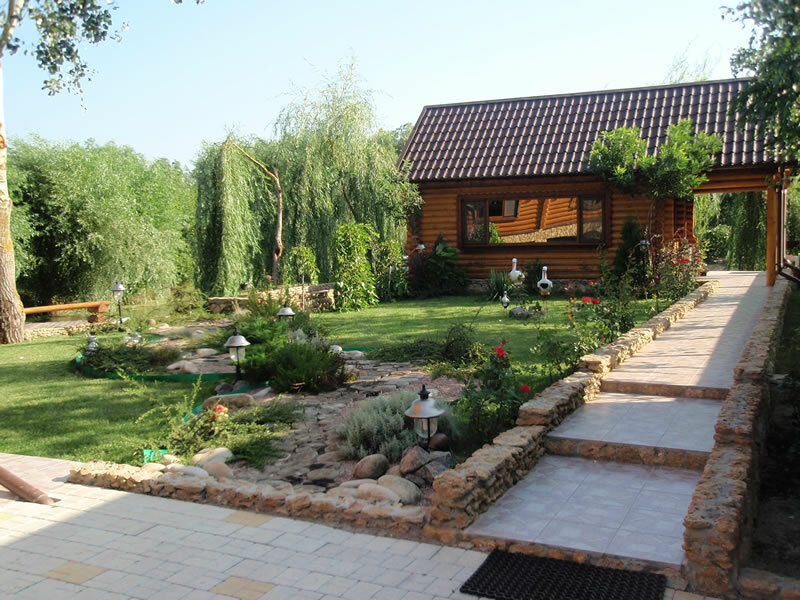 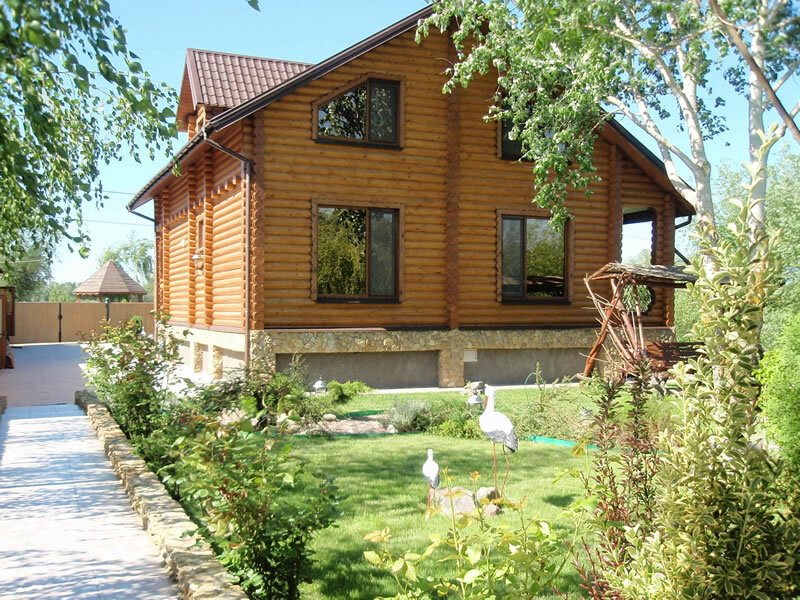 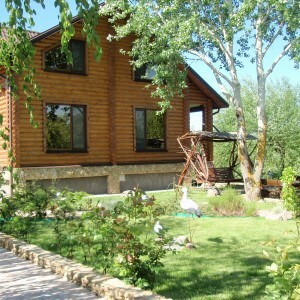 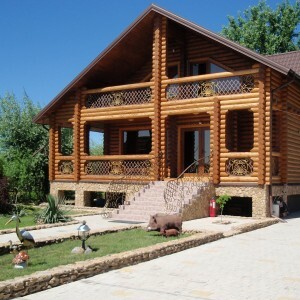 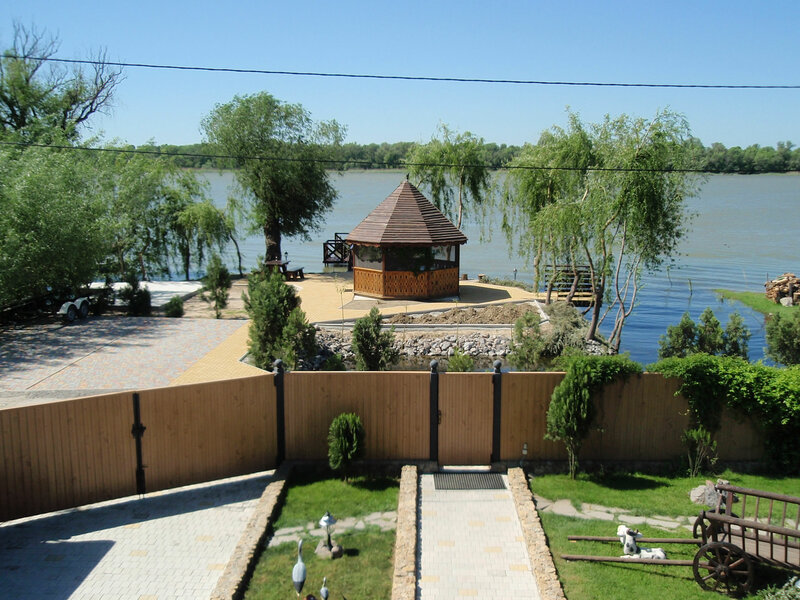 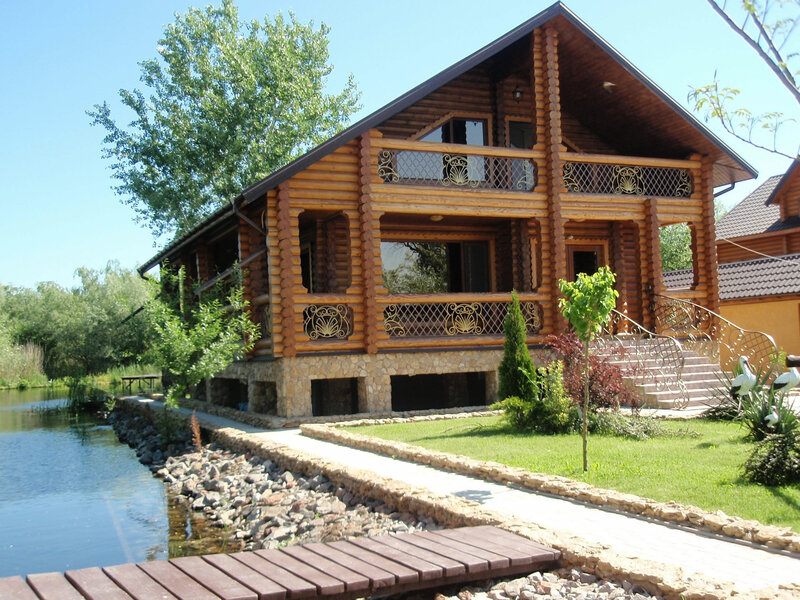 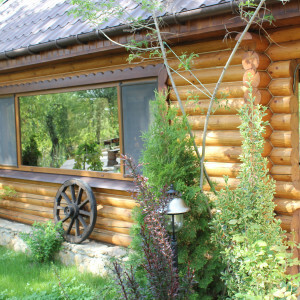 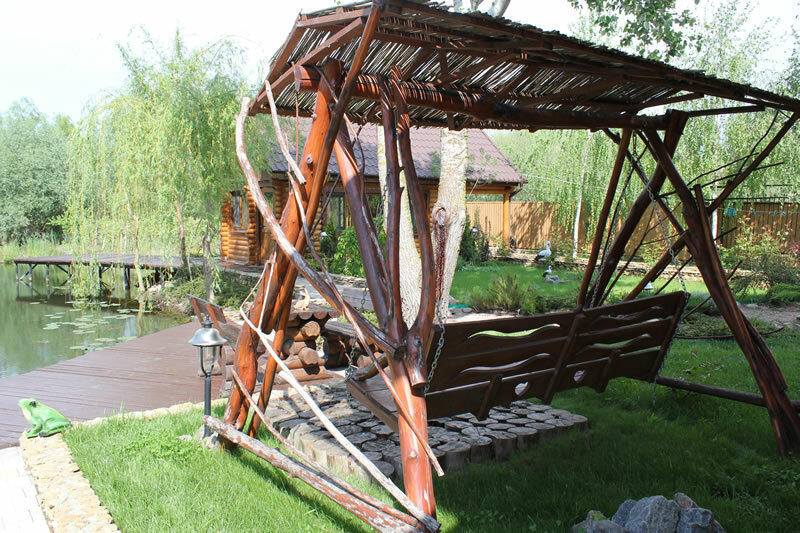 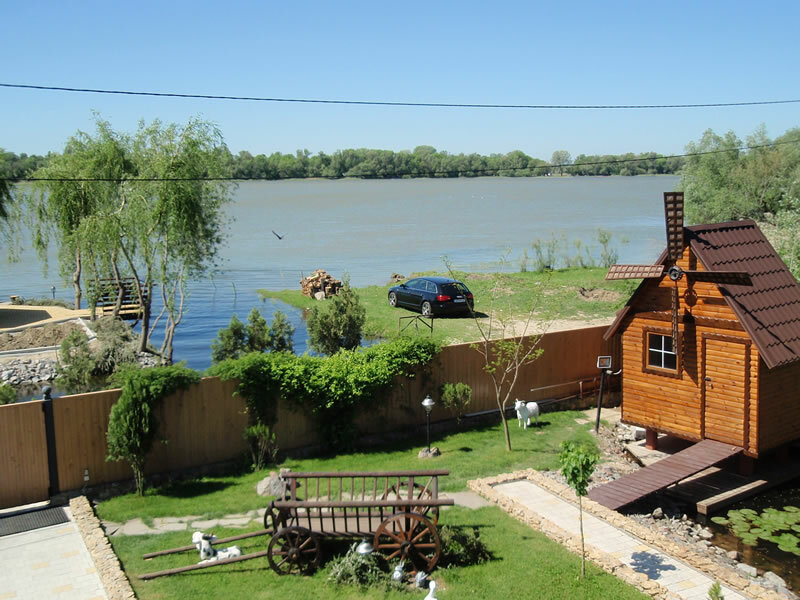 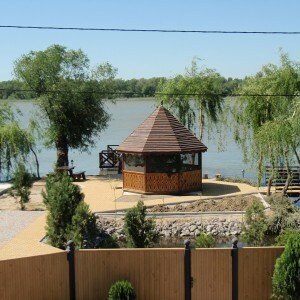 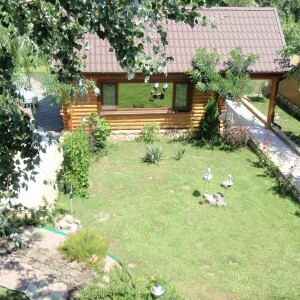 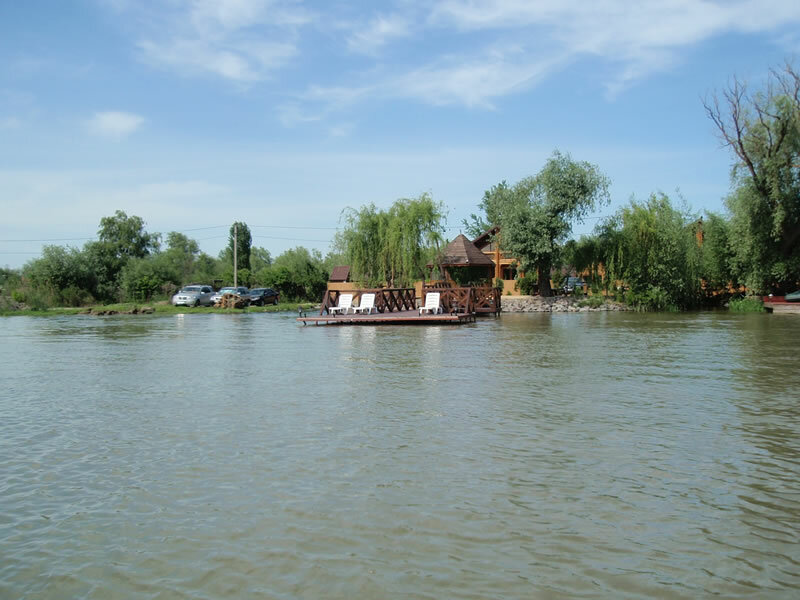 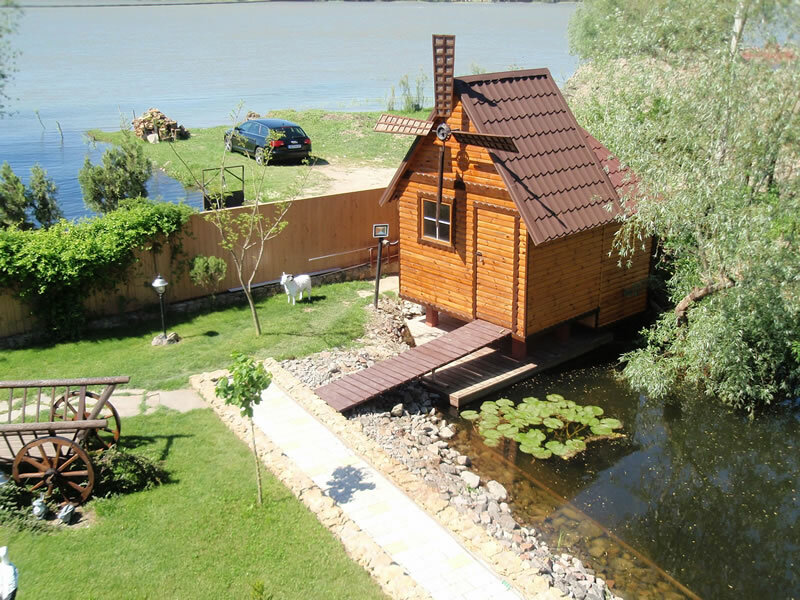 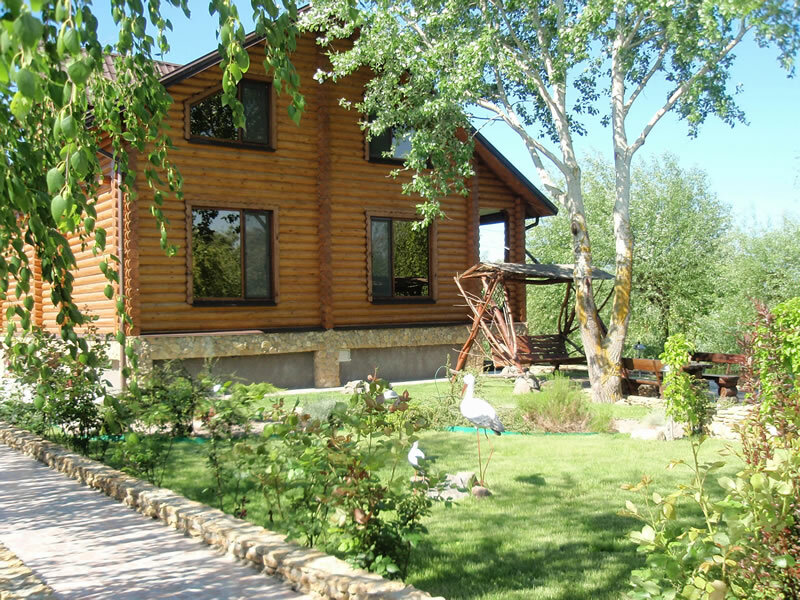 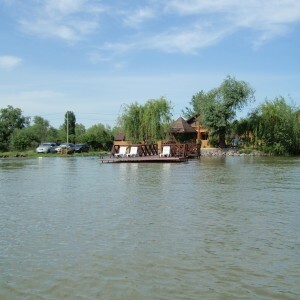 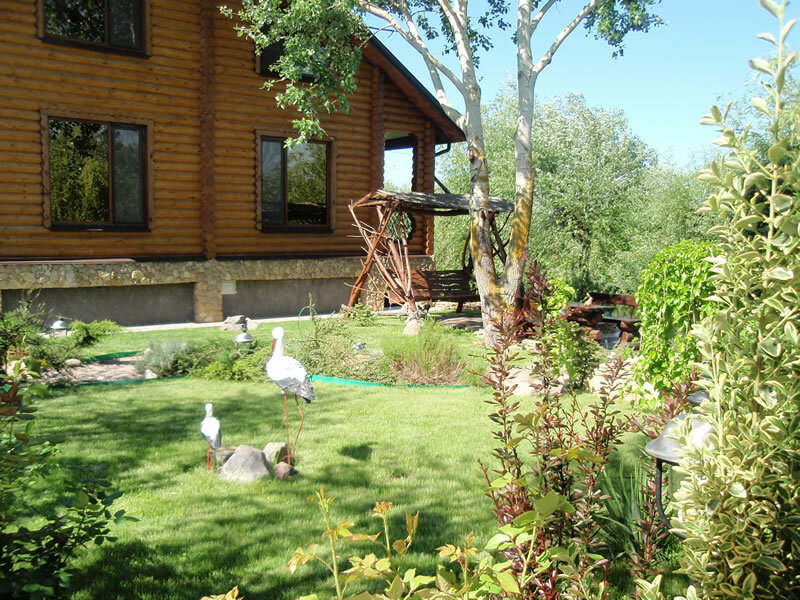 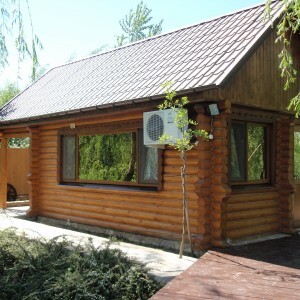 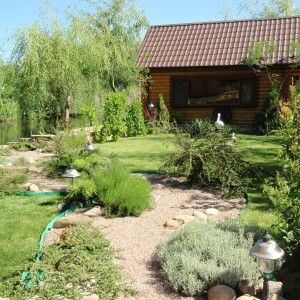 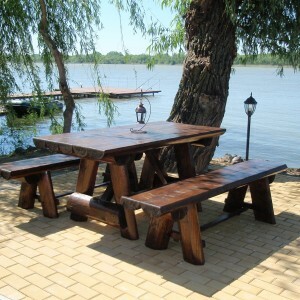 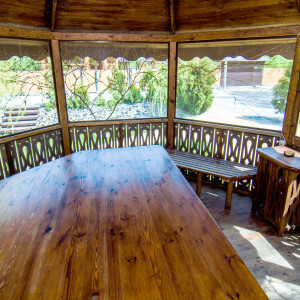 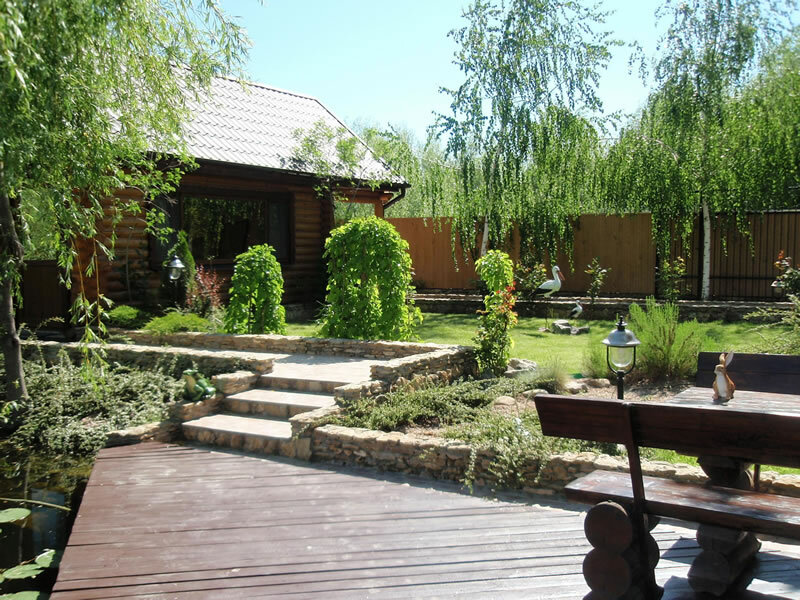 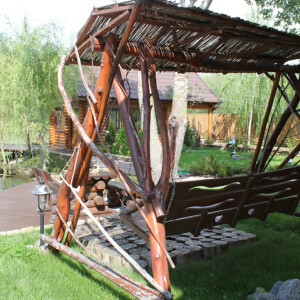 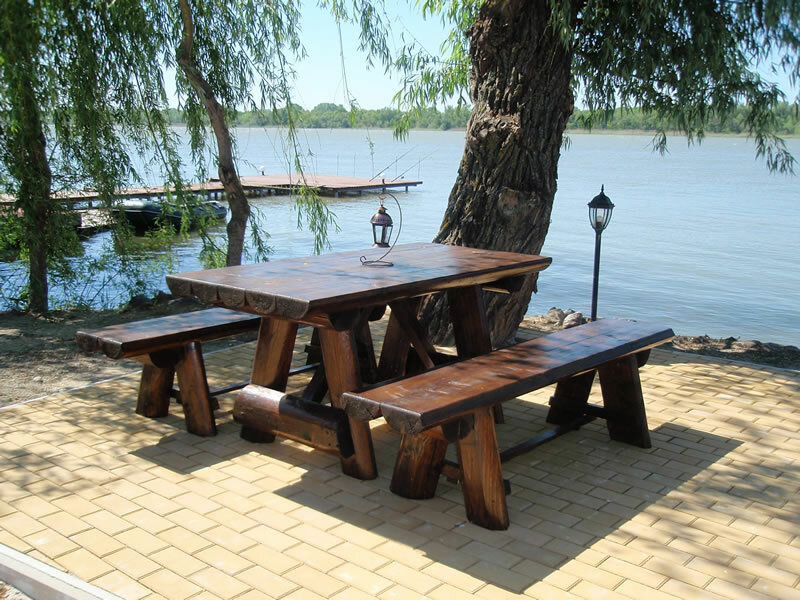 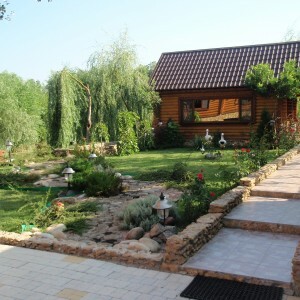 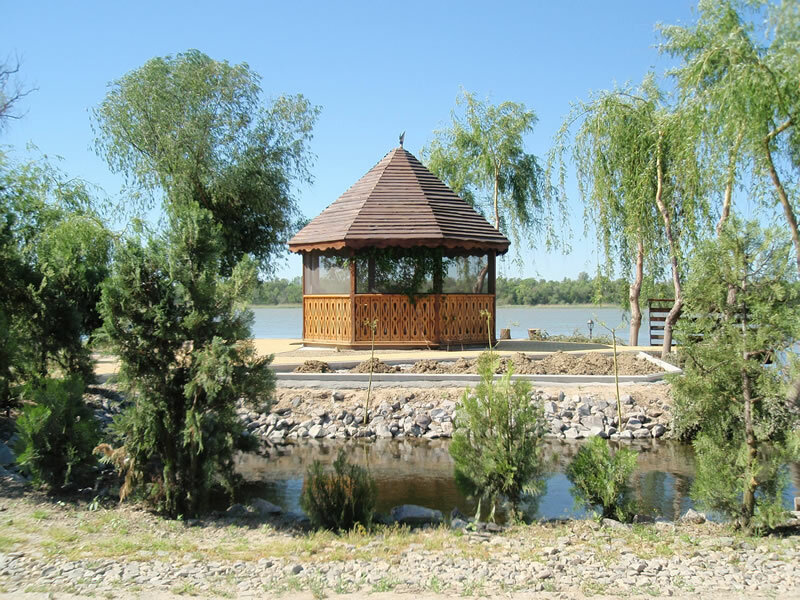 A spacious carved gazebo with large wooden table is equipped for guests on the Danube riverside. 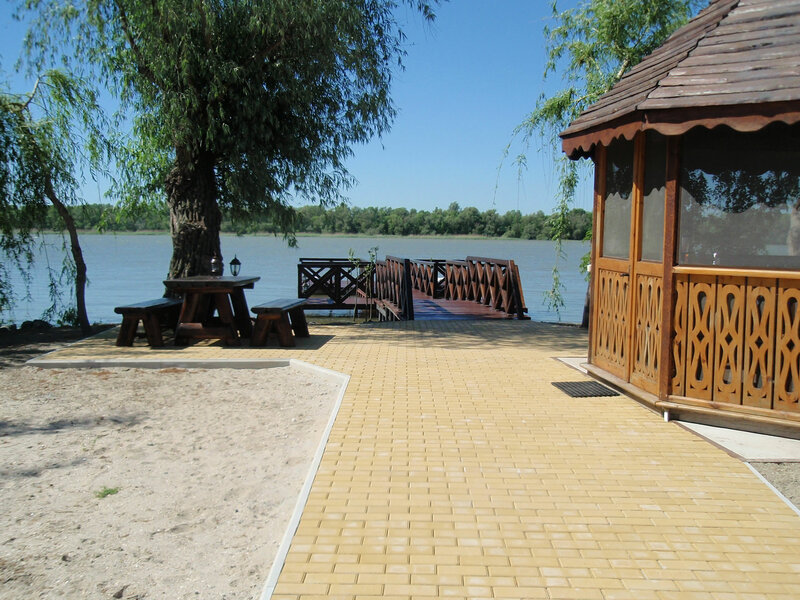 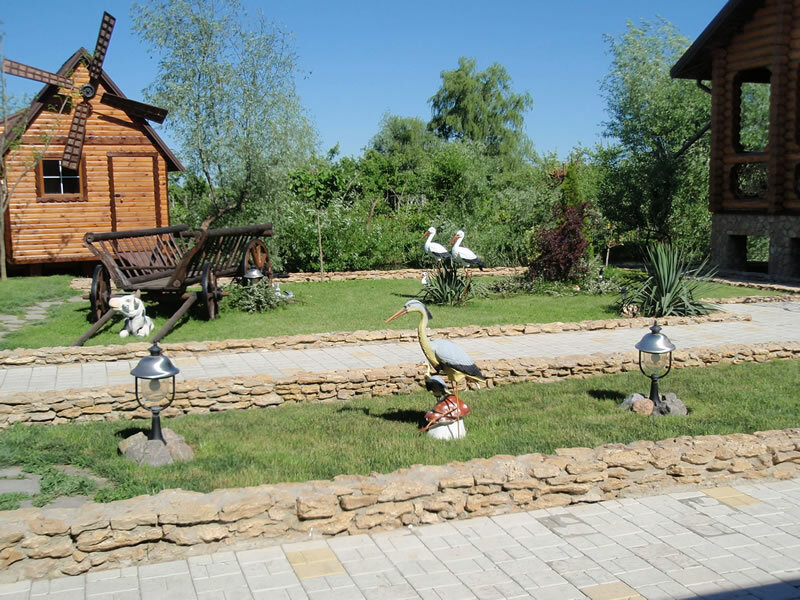 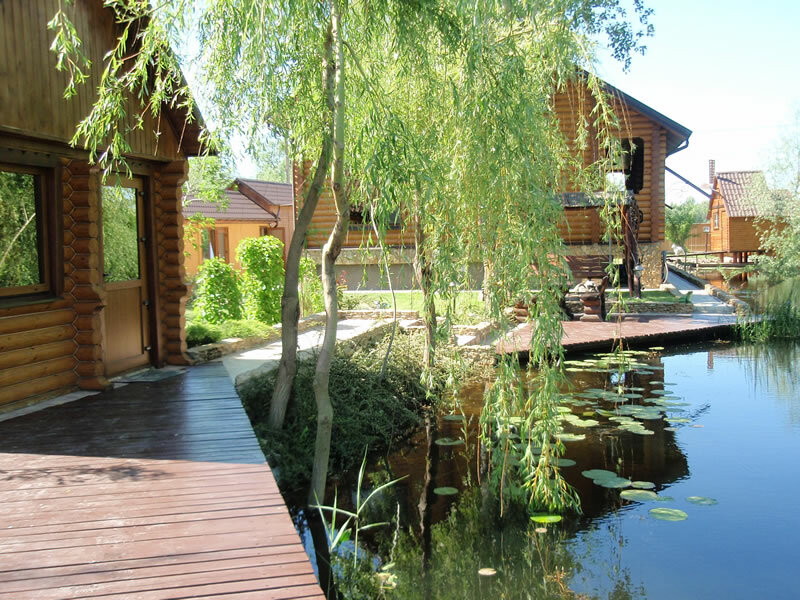 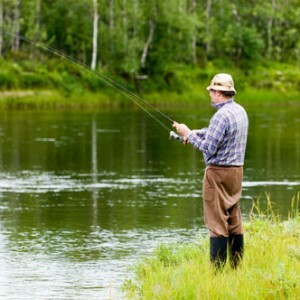 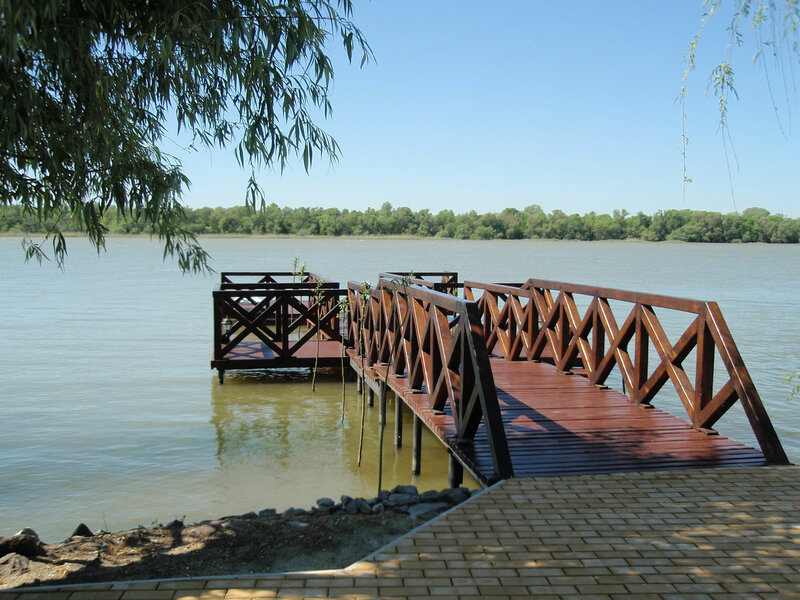 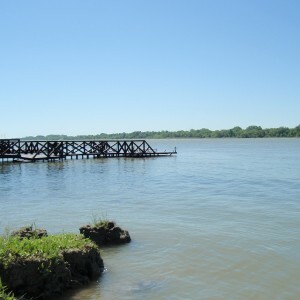 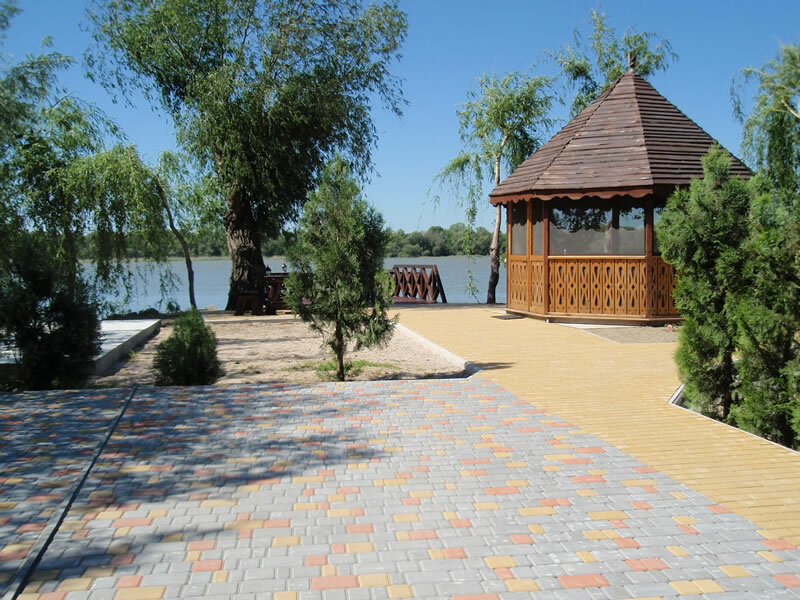 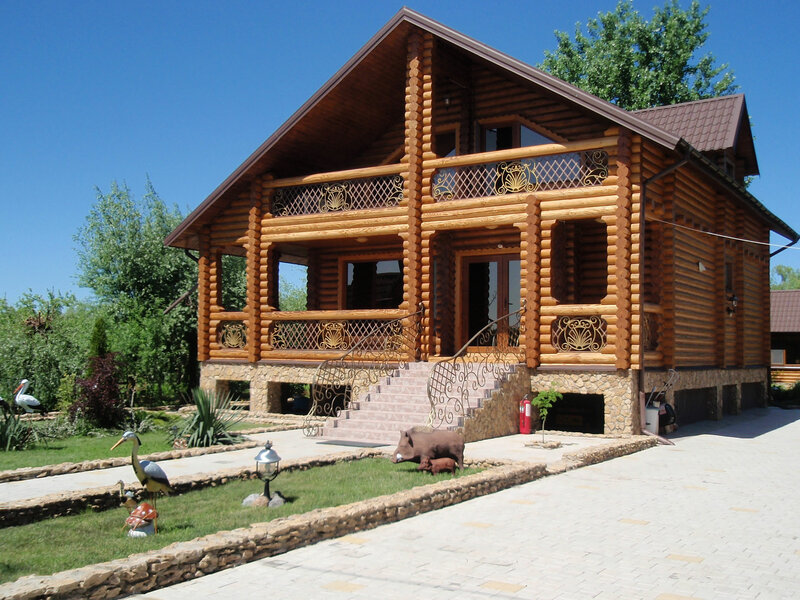 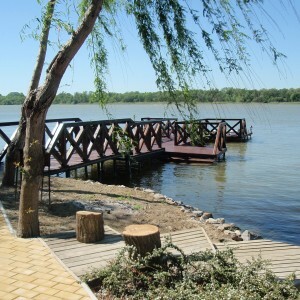 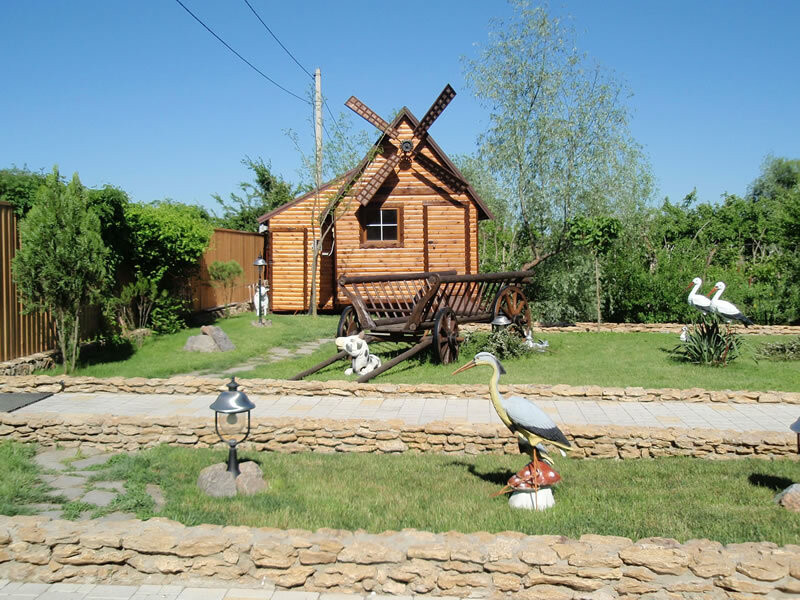 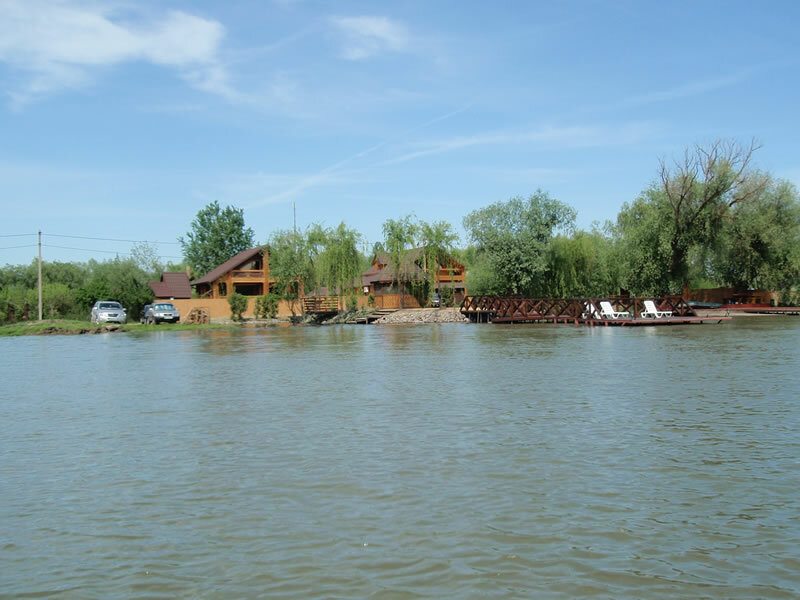 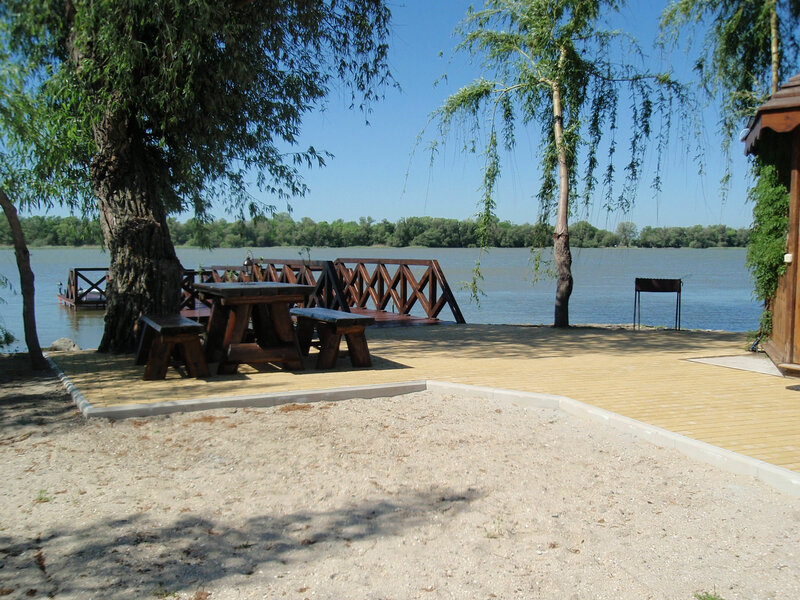 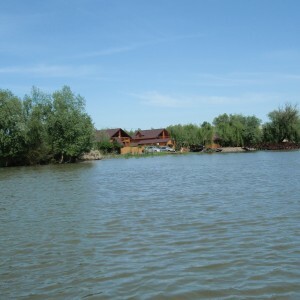 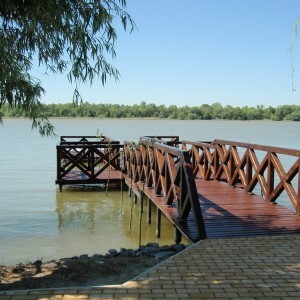 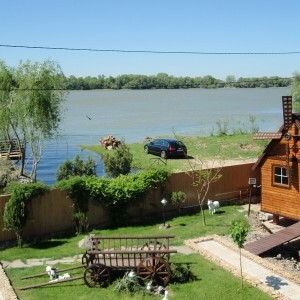 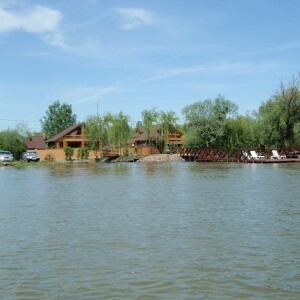 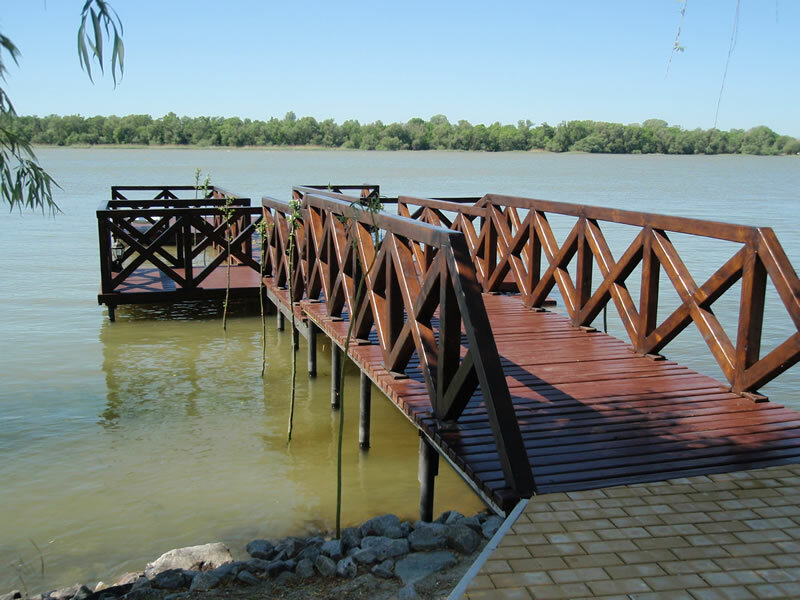 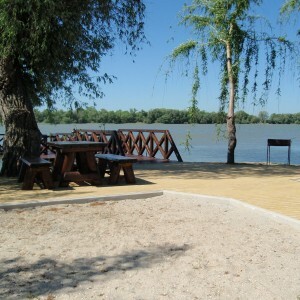 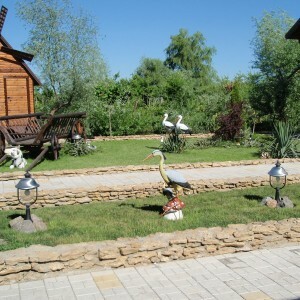 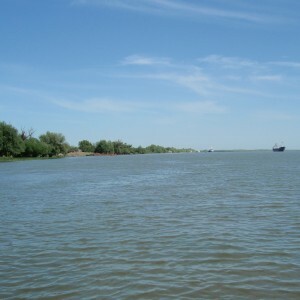 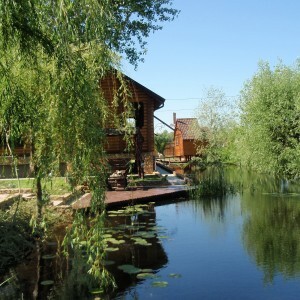 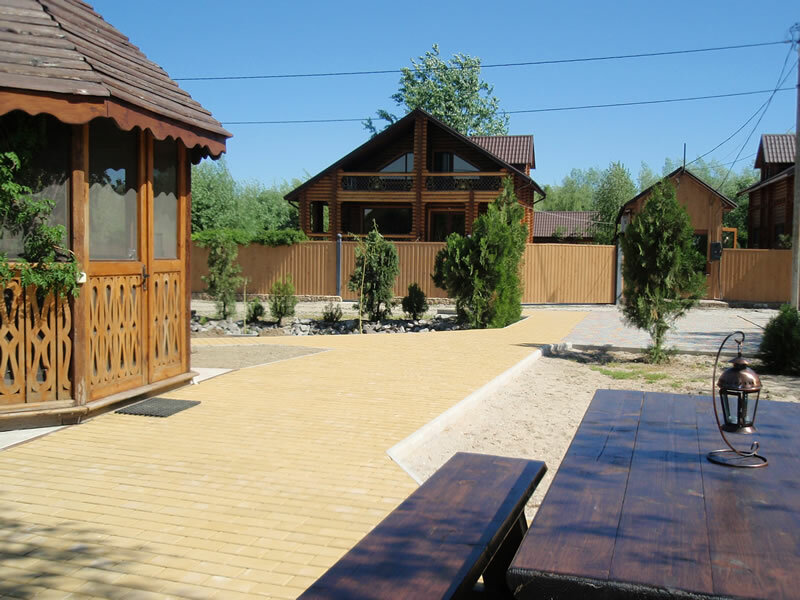 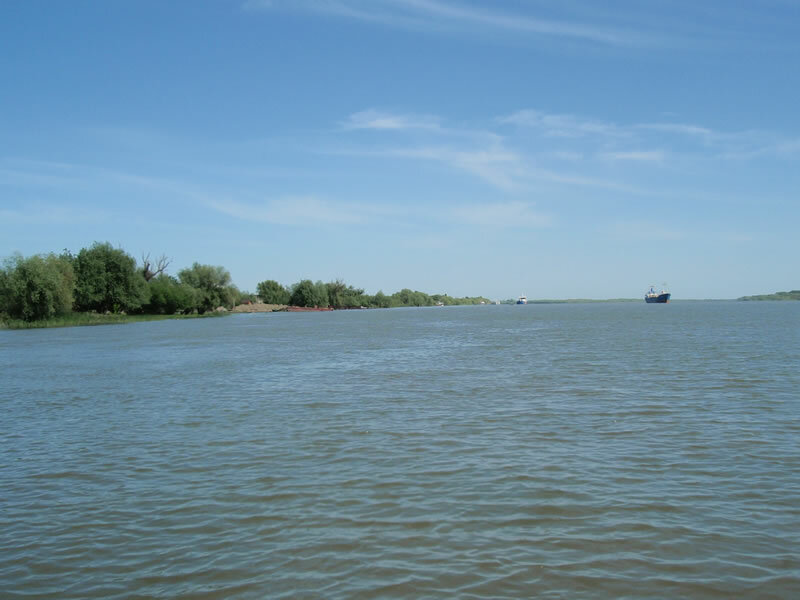 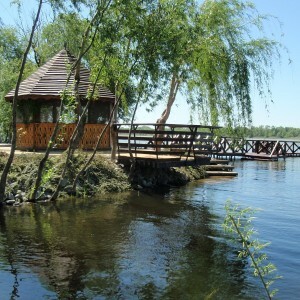 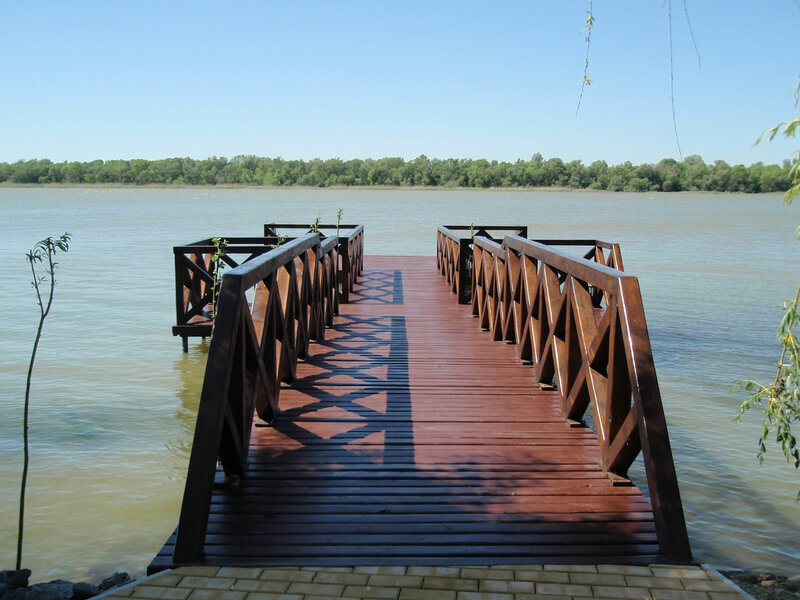 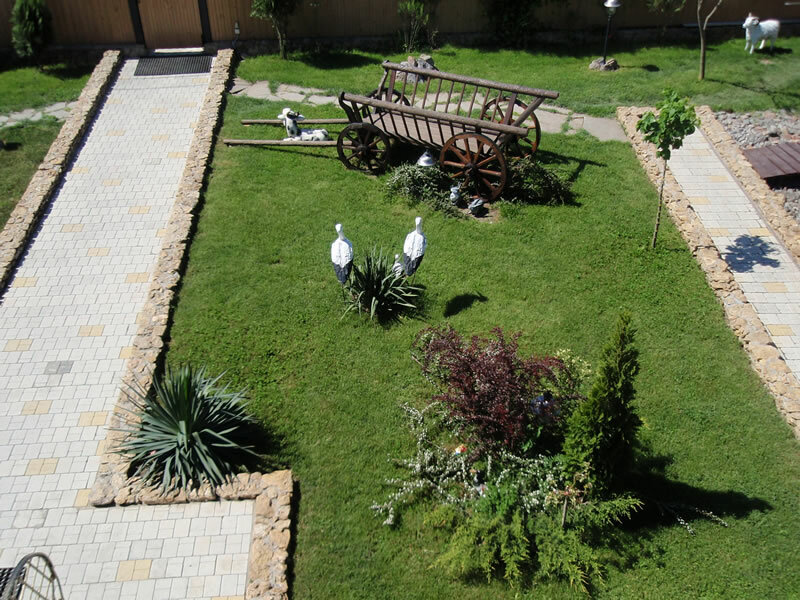 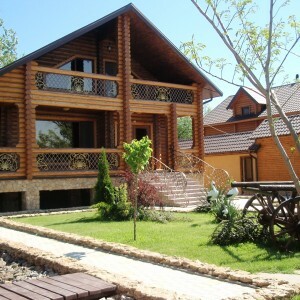 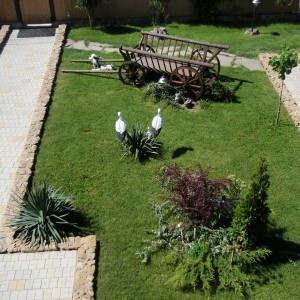 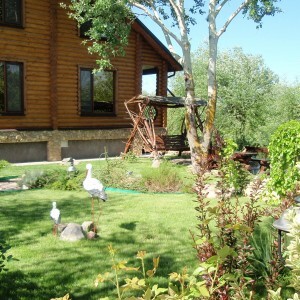 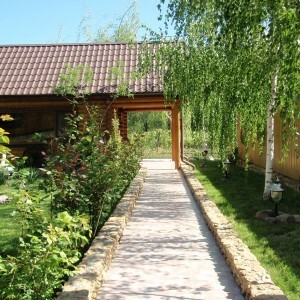 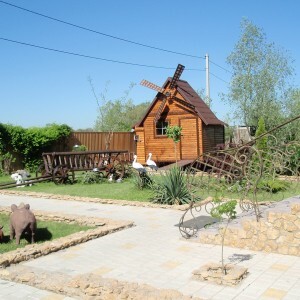 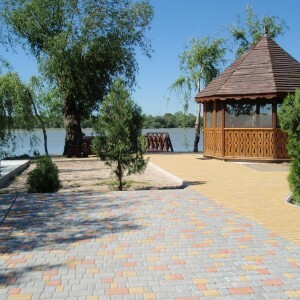 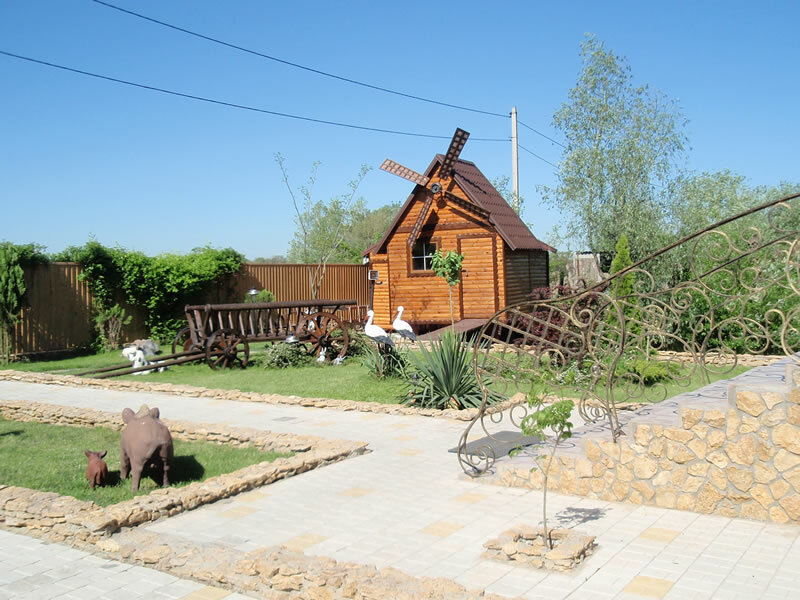 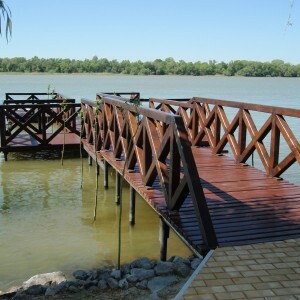 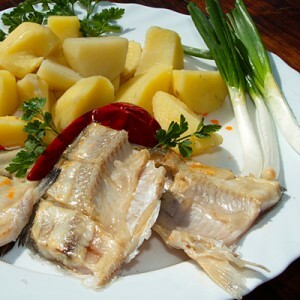 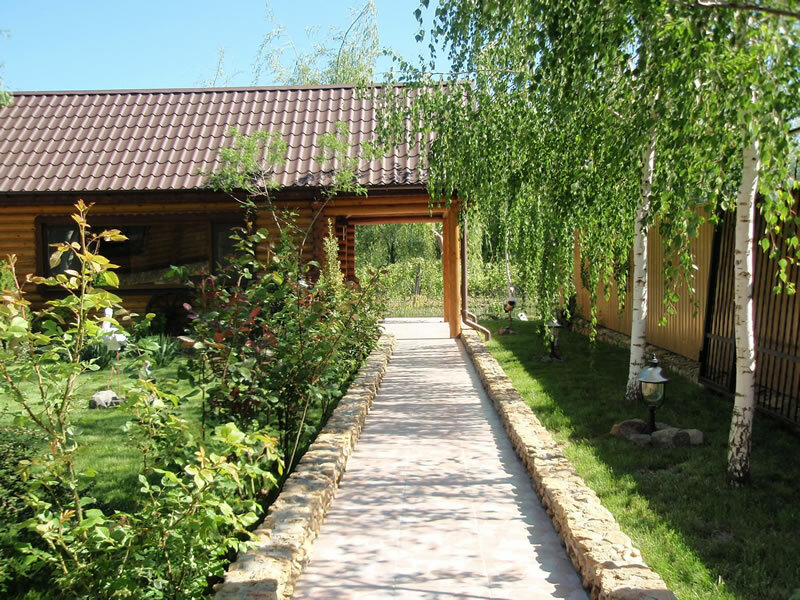 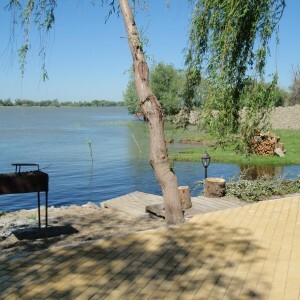 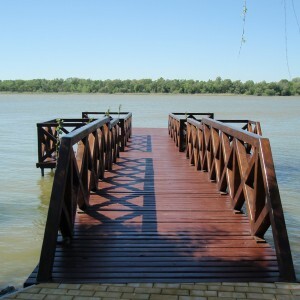 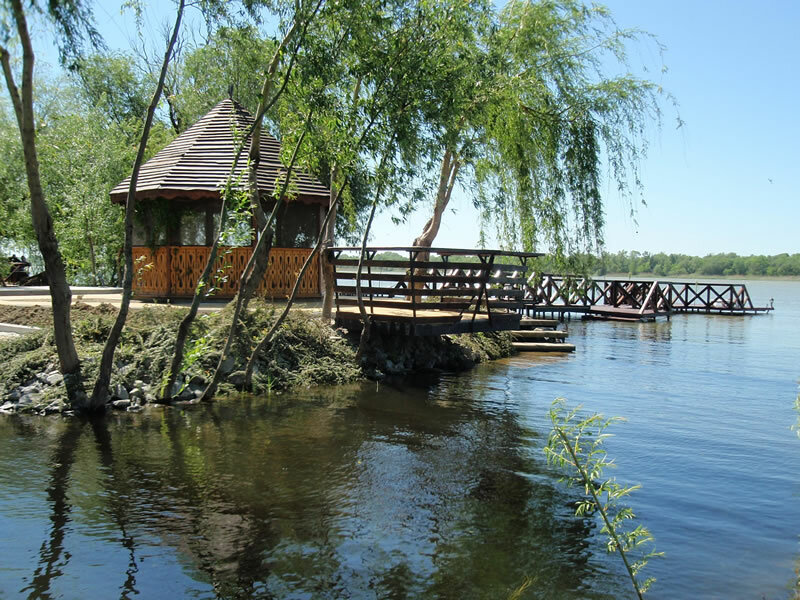 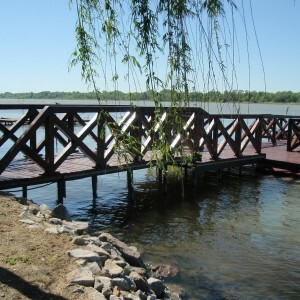 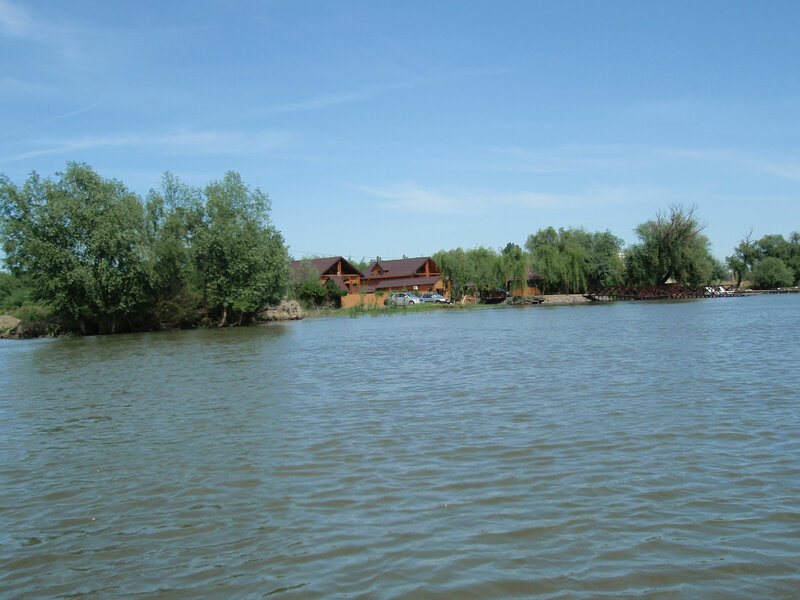 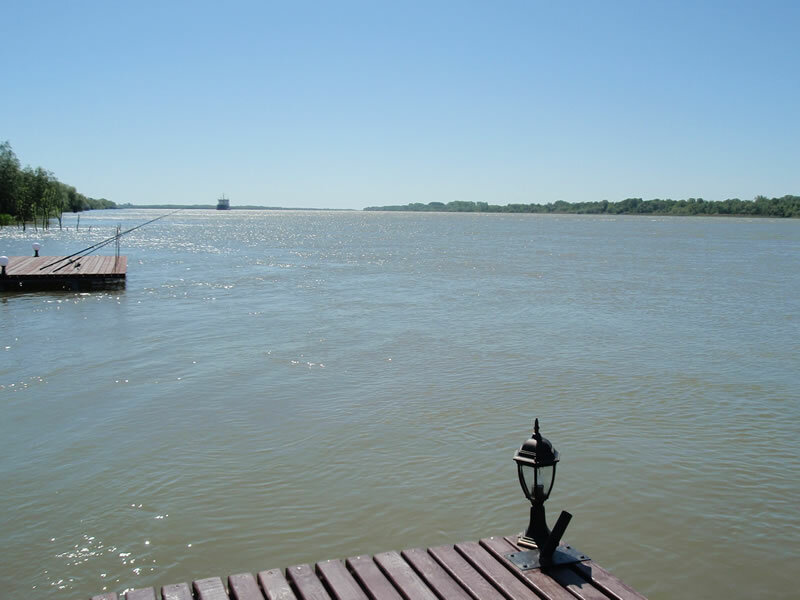 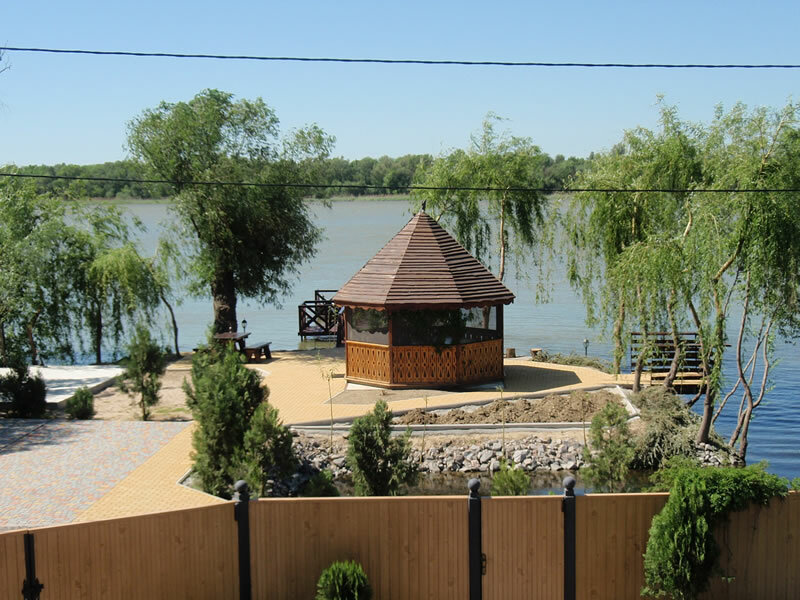 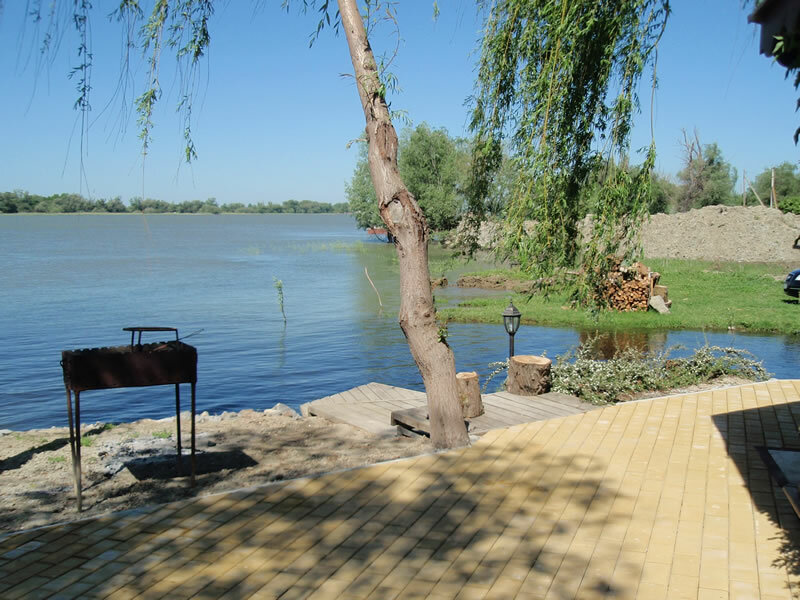 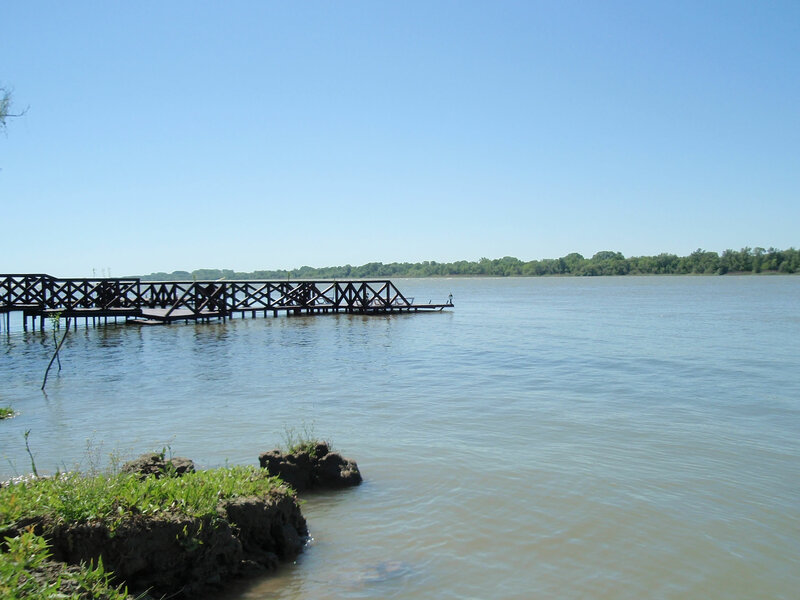 You may cook convivial fish soup and shashlik on the “captain’s bridge” near the gazebo. 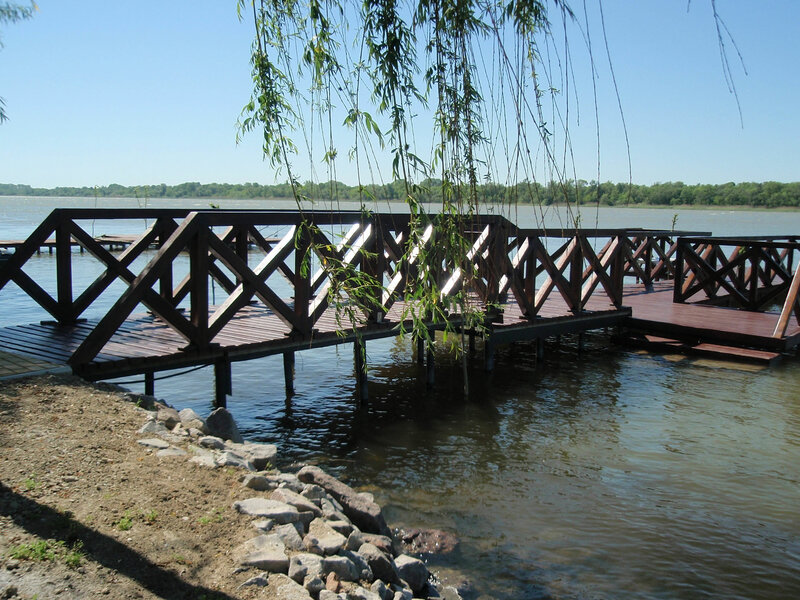 A wooden berth with beautiful wooden railings sweeps away to the Danube waters. 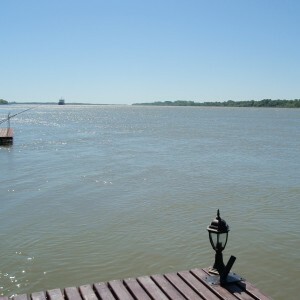 Here you can swim, fish and welcome ships passing by. 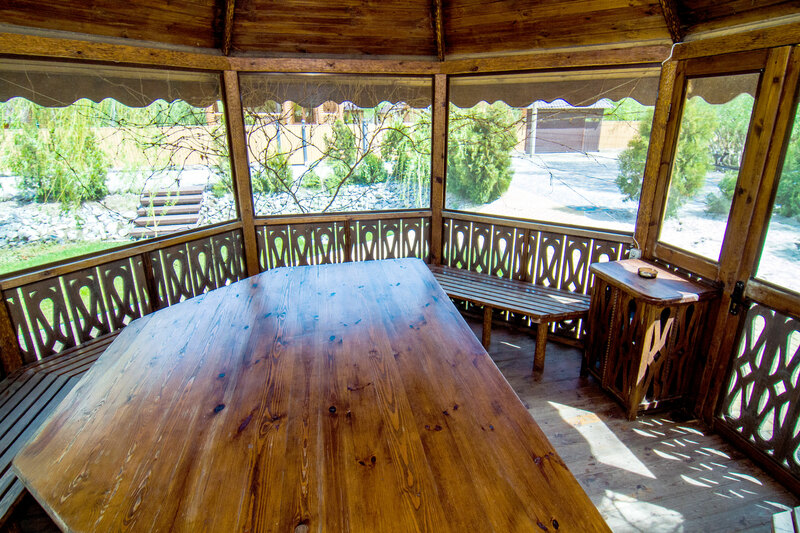 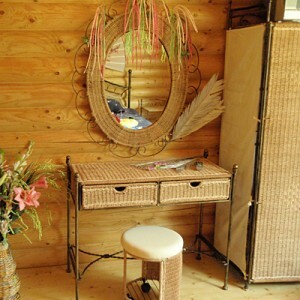 Everything in the “Villa” is made for you feeling comfortable. 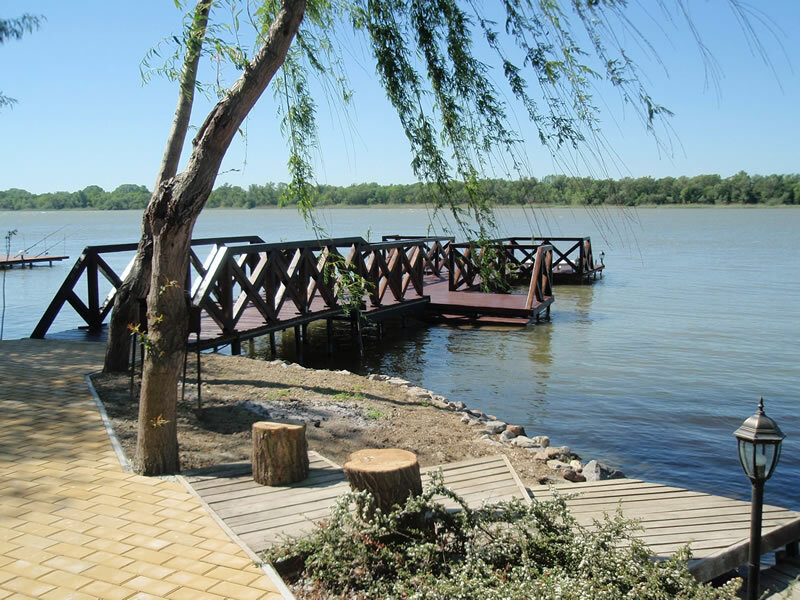 If you are planning to come by car and to bring boats or holiday cruisers, there is a free parking place and boat harbour on the territory of the country-house. 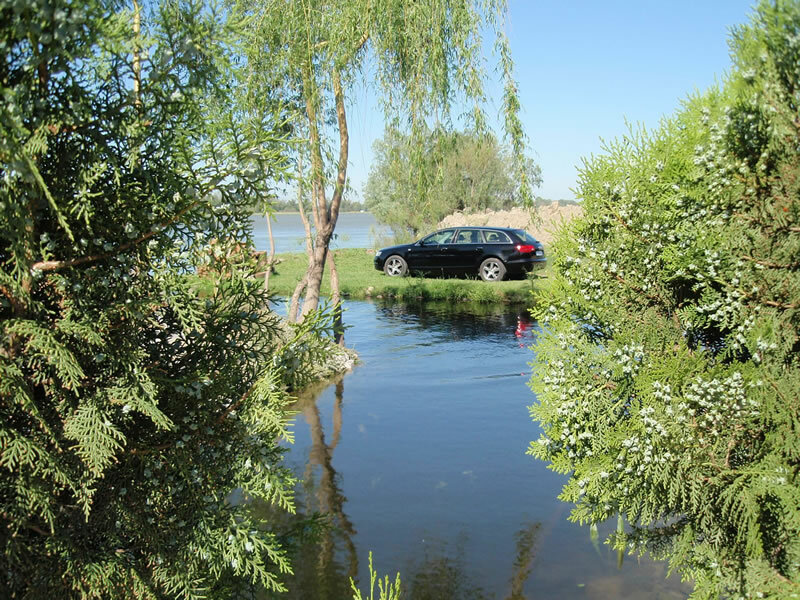 A guarded parking with video recording may contain 8-10 cars and 5-6 boats.